It’s the kidneys’ job to remove waste and extra liquid from the body. When this does not happen, the extra fluid and water buildup causes swelling. This can be in the hands, feet, ankle joints, face and under the eyes. Healthy kidneys make a hormone called erythropoietin that aids production of oxygen-carrying red blood cells. Damaged kidney make less of this hormone, eventually leading to a decreased red blood cell count. 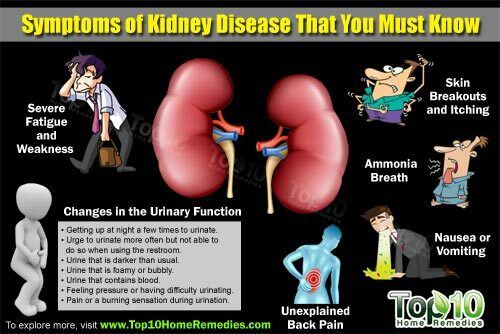 Unexplained aches and pains in the back as well as sides of your abdomen can be symptoms of undiagnosed kidney disease or kidney infections. When kidneys do not function properly, you may experience pain, stiffness and fluid in the joints.